Not only are Ava's attention to details impeccable (the hat, the tassles on Mommy's poncho, the fun swirls in her dress), but I notice that she's trying something out with the arms and hands. When Ava usually draws hands, she draws them as simple three-fingered stick-like hands -- generally when she's drawing on a whim, not ready to tackle the difficult task of drawing out all the fingers, and such. But here, Ava focused more on the thickness of the arms, hands, and especially, the fingers. Notice that there are five fingers on each hand. This is something new in her artistic development, in my eyes. She's thinking about volume and density here. But why would she slight Baby Ezra in the finger department over there on the right? My guess is that he's smaller, therefore the details of the fingers would've been very difficult to render. But I do enjoy all the details that's she's given him still: the way that his feet have a few toes, and especially his blue cast, complete with doodles (we all signed and drew on his cast before it was taken off). A fun, cheerful drawing. Makes me happy. Ava keeps getting better and better! I really like the design of this piece... 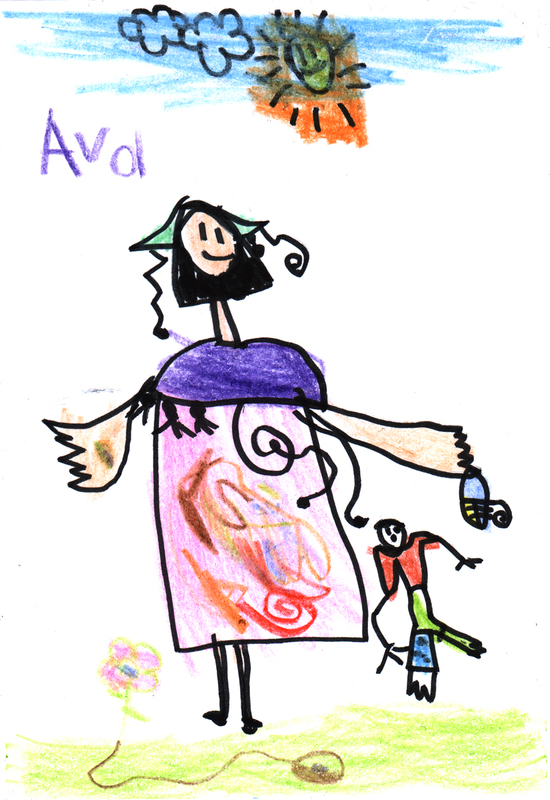 I especially like the way she drew Andrea's arms and hands and her choice of color throught the drawing. Fantatsic! very fun and cheerful! i like how ezra is favoring the uncasted leg! so very creative and fun to watch her development. nice piece. really, she was so pleased with the pattern on my dress... and you should have heard her talking about that special rainbow seed! Yay! Ava's drawings always make me cheerful whenever I feel unconfident about today's situation. Ezra definitely looks a bit weird especially with his LONG right arm and Mom just looks pretty fashionable in such a sunny day!